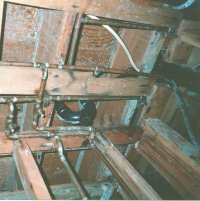 Moisture is one of the key requirements for mold growth in homes. There are different types of mold. Some molds require relatively very low levels of available moisture for them to grow. These types of mold are referred to as xerophilic and are likely to be found in almost every home. The common xerophilic fungi belong to the genera Aspergillus, Penicillium and Wallemia. Some other molds require wet or highly damp prolonged conditions. These are referred to as hydrophilic (“water loving”) fungi and their presence in homes is an indication of moisture damage. Examples of indicators of moisture damage include Chaetomium, Stachybotrys and Fusarium. Reducing humidity. It’s recommended that relative humidity be maintained at or below 60%. Frequently clean floor, carpet, and remove dust on surfaces. This reduces the amount of spores that would otherwise start new mold growth when moisture becomes available. What are wood rot fungi? Wood is one of the major components of building materials in residential and office buildings. In fact it’s almost impossible to miss a wooden item in a building. It is subject to attack by wood rot fungi and other organisms if it’s not well preserved. Favourable temperatures. Generally wood colonizing fungi have optimal growth temperature at aound 25 degrees Celsius. Adequate moisture. Moisture is the most critical requirement for fungi to colonize wood. Fungi will not attack dry wood (i.e., with a moisture content of 19 percent or less). Decay fungi require a wood moisture content of about 30%. Adequate oxygen. Most fungi require (oxygen) for growth. Food source. Like every other living organism, fungi require nutrients for growth. These are readily available on wood surfaces in form of dust. The wood itself is made of biodegradable compounds (cellulose, hemicellulose,lignin). There are 2 groups of wood rot fungi. These are the wood-decaying fungi (wood-rotting fungi) and the Wood-staining fungi (sapstaining fungi). The wood-decaying fungi are the most damaging of all the wood destroying fungi. These fungi are prolific producers of strong enzymes that they use to breakdown complex wood components (cellulose, hemicellulose,lignin) to simple sugars that they can utilize as food. Wood-decay fungi colonize the sapwood and heartwood of most tree species. These fungi grow inside the wood and/or on wood surfaces. On the wood surface they appear as fan-shaped patches of fine, threadlike, cottony growths or as rootlike shapes. The color of these growths may range from white through light brown, bright yellow, and dark brown. The spore-producing structures (fruiting bodies) of the fungus may take the form of mushrooms, shelflike brackets, or flattened, crustlike structures. Fine, threadlike fungal strands called mycelia grow throughout the wood and excrete enzymes that digest parts of the wood as food. By breaking down the cellulose, hemicellulose,and lignin wood the strength and other properties of the wood are destroyed. The rate of decay and extent of deterioration depend on the duration of favorable conditions for fungal growth. Decay will stop when the moisture content is lower than the fungu’s requirements. Decay slows down significantly if the temperature of the wood is either too low or too high. Early decay is more easily noted on freshly exposed surfaces of unseasoned wood than on wood that has been exposed and discolored by the weather. Wood decay fungi are generally grouped into three major categories: brown rot, white rot, and soft rot. The ease with which the dry wood substance can be crushed to a brown powder. The white rot fungi, Phellinus megaloporus and Poria contigua, break down both lignin and cellulose in wood. They have a bleaching effect that may make the damaged wood appear whiter than normal. Affected wood shows normal shrinkage and usually does not collapse or crack across the grain as with brown rot damage. However, the infested wood loses its strength gradually until it becomes spongy to the touch. White rot fungi usually attack hardwoods, but several species can also cause softwood decay. Soft rot fungi such as Chaetomium globosum usually attack very wet wood, causing a gradual and shallow (3-4 mm) softening from the surface inward that resembles brown rot. The infested wood surface darkens and becomes very soft, hence the name soft rot. Unlike the wood-decay fungi, wood-staining fungi are only a cosmetic problem. They tend to grow on the surface of wood. Examples of wood staining fungi include Ceratostomella spp. and Diplodia spp. These fungi penetrate and discolor sapwood, particularly of softwood species. Typical sapstain, unlike staining by mold fungi, cannot be removed by brushing or planing. Sapstain fungi may become established in the sapwood of standing trees, sawlogs, lumber, and timbers soon after they are cut and before they can be adequately dried. The strength of the wood is not greatly affected, but the wood may not be fit for use where appearance is important (such as siding, trim, furniture, and exterior millwork that is to be clear-finished). Superficial wood colonizing fungi such as Fusarium spp and Penicillium spp., first become noticeable as green, yellow, brown, or black, fuzzy or powdery surface growths on the wood surface. The colored spores they produce can usually be brushed, washed, or surfaced off. On openpored hardwoods, however, the surface molds may cause stains too deep to be easily removed. Freshly cut or seasoned wood stockpiled during warm, humid weather may be noticeably discolored with mold in less than a week. Molds do not reduce wood strength, but they can increase the capacity of wood to absorb moisture, thus increasing the potential of attack by decay fungi. Biodeterioration is a terminology used to describe any undesirable change in the properties of a material caused by the vital activities of organisms. Fungal growth requires suitable temperature, moisture and air (oxygen). Fungi are heterotrophs that acquire nutrients by absorption. They secrete hydrolytic enzymes (exoenzymes) and acids to decompose complex molecules into simpler ones that can be absorbed and used as nutrients. Hence, they are believed to be potential contributors to biodeterioration of different kinds of materials containing cellulose, silicate mineral (mica and orthoclase), iron and magnesium-bearing minerals (biotite, olivine, pyroxene) etc. How are Fungi involved in biodeterioration? The rate of biodeterioration depend on prevailing environmental conditions and the fungus involved. There are different mechanisms of biodegradation. These include microbial corrosion, hydrocarbon degradation and biodegradation of cellulose. Aspergillus niger, Chaetomium globosum, Scopulariopsis brevicaulis, Trichoderma koningii, Trichothecium roseum and Eurotium chevalieri are cellulolytic fungi. Their efficiency to degradate cellulosic (cellulose containing) materials is due to their ability to produce large amounts of cellulase enzymes. Stachybotrys chartarum is a common fungus growing on paper (such as that covering gypsum wallboard) in damp buildings. Some fungi cause blue stain and soft rot of wood, discolouration and loss of strength of cotton materials. Many fungi spoil food in storage. Aspergillus flavus grows on peanuts and many other substrates, producing a mycotoxin called aflatoxin, which contaminate food and causes liver damage. Fusarium graminearum grows on feed corn and produces the mycotoxin zearalenone that causes oestrogenic syndrome in animals. Through the action of excreted oxalic and citric acids fungi can deteriorate marble, limestone, granite and basalt. Several species of fungi are involved in biodeterioration of stone monuments in different countries. Some of these fungi are Aspergillus elegans, Aspergillus flavus, Aspergillus nidulans, Aspergillus niger, Aspergillus versicolor, Alternaria sp, Cladosporium cladosporioides, Cladosporium sphaerospermum, Cunninghamella echinulata, Curvularia lunata, Fusarium roseum, Gliocladium virens, Penicillium crustosum, Penicillium glabrum, Penicillium chrysogenum (=Penicillium notatum), Rhizopus arrhizus. Biodeterioration is a problem worldwide. Several control measures have been applied to prevent the biodeterioration. These include use of fungicides, biological control, prevention of biodeterioration by control of environmental conditions, periodic cleaning of dirt, dust and spores, and use of radiation. Trichothecium sp. is found in decomposing vegetation, soil, corn seeds and in flour. The species Trichothecium roseum can produce a trichothecene toxin which may be associated with disease in humans and other animals. Trichothecium sp. is reportedly allergenic. It is found as a secondary invader of plants, food, soil, paint and textiles. Curvularia sp. is reportedly allergenic. Species of Curvularia are pathogens and saprophytes on a wide range of plants. Curvularia may cause corneal infections, mycetoma and infections in immune compromised hosts. Aspergillus versicolor is commonly found in soil, hay, cotton and dairy products. It can produce the mycotoxins sterigmatocystin and cyclopiaxonic acid . These toxins can cause diarrhea and upset stomach. It is reported to be a kidney and liver carcinogen. This species is only occasionally pathogenic. Aspergillus niger is commonly found in the environment on textiles, in soils, grains, fruits and vegetables. It has a musty odor. It is a less common cause of aspergillosis. It has been reported to cause skin and pulmonary infections. It is a common cause of fungal related ear infections-otomycosis. Aspergillus nidulans is found in mild to warm soils and on slowly decaying plants. Can produce the mycotoxin sterigmatocystin. This toxin has been shown to produce liver and kidney damage in lab animals. Aspergillus nidulans is associated with aspergillosis of the lungs and/or disseminated aspergillosis. It is only occasionally pathogenic. Aspergillus flavus is reportedly allergenic. It grows on mouldy corn and peanuts and grains. It can be found in warm soil, foods and dairy products. Aspergillus flavus can be found in water damaged carpets. Some strains of Aspergillus flavus are capable of producing a group of mycotoxins, the aflatoxins. Aflatoxins are known carcinogenic and are poisonous to humans by ingestion. It may also result in occupational disease via inhalation. The production of the aflatoxin is dependent on the growth conditions and on the substrate used as a food source. Gliocladium sp. is a fungus which is structurally similar to Penicillium sp. It is reported to be allergenic.